Suave Richard, who emerged as first choice at the last minute, romped to a convincing victory in this year’s Osaka Hai, capturing his first G1 title. 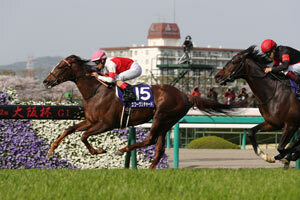 The four-year-old chestnut captured his first grade-race win in last year’s G3 Kyodo News Hai before turning in a sixth in the Satsuki Sho (Japanese 2000 Guineas) and went on to mark a 3/4-length second to Rey de Oro in the following Tokyo Yushun (Japanese Derby). After claiming the G2 Copa Republica Argentina last autumn, Suave Richard was fourth in the Arima Kinen and notched his third grade-race win in the G2 Kinko Sho which was his latest and only start of this season. Trainer Yasushi Shono celebrates his first JRA-G1 title and ninth grade-race victory since opening his yard in 2007, while jockey Mirco Demuro now boasts 25 wins at the highest level, his latest with Persian Knight in last year’s Mile Championship. While Yamakatsu Raiden gunned to the front to set the pace by the initial turn, Suave Richard traveled near the rear after breaking from the second widest stall, but swiftly increased position making headway down the backstretch to find himself right outside the leader before the third turn. The four-year-old easily took over the lead from the tiring pacesetter before entering the stretch and went along on his untroubled way to victory, holding off the fast but late closure by Persian Knight for a 3/4-length win. “Since the pace was very slow, I decided to make an early bid. He responded so well, I had absolutely no doubts in him and he stretched beautifully. He didn’t change leg in the (right-handed) Arima Kinen, but today he did which is a promising factor—something to look forward to from now on,” commented Mirco Demuro after the race. Sixth favorite and last year’s G1 Mile Championship victor Persian Knight was keen to go but stuck in mid-field in the early stages however, edged out to find room at the top of the straight and while unleashing the fastest late drive in the 16-horse field, the dark bay furiously picked off all but one of his front runners for the runner-up seat. Last year’s Satsuki Sho winner and second pick Al Ain sat off the pace in fifth to sixth, found a path behind the winner in the stretch and strived to reach contention but was caught by the fast-closing Persian Night in the final strides to cross the wire a half-length late in third. 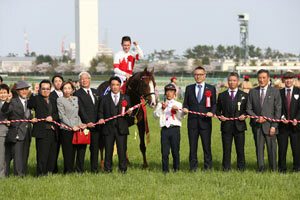 Y. Shono NICKS Co., Ltd.
H. Otonashi Sunday Racing Co., Ltd.
Y. Ikee Satomi Horse Company Co., Ltd.
N. Sugai KT Racing Co., Ltd. The Osaka Hai, renewing its name this year from the familiarly known Sankei Osaka Hai, was established in 1957 as a handicap race open to runners of four years of age and upwards run over 1,800m at Hanshin Racecourse in March. After the distance was extended to 2,000m in 1972, the date was moved to one week earlier to the Oka Sho (Japanese 1000 Guineas) in 1981. The race was given G2 status in conjunction with the new grading system in 1984, opened its doors to foreign competitors in 2003 and was upgraded to G1 last year. The winner of the race will automatically earn a starting position in the Irish Champion Stakes (G1, 2,000m) held in September. Attracting strong contenders by serving as a prep race for G1 spring races for older horses such as the Tenno Sho (Spring) (G1, 3,200m) and the Takarazuka Kinen (G1, 2,200m), many Osaka Hai champions have gone on to achieve G1 successes; Meisho Samson (JPN, by Opera House) in 2007, Hiruno d’Amour (JPN, by Manhattan Cafe),who set the race record of 1:57.8 in 2011, two-time Horse of the Year Kitasan Black (JPN, by Black Tide) in 2017, all went on to capture the Tenno Sho (Spring) that followed; and Dream Journey (JPN, by Stay Gold) in 2009 landed his Takarazuka Kinen victory two starts later. Winners who also showed extraordinary accomplishments include 2008 champion Daiwa Scarlet (JPN, by Agnes Tachyon), legendary 2013 winner Orfevre (JPN, by Stay Gold) and 2014 victor Kizuna (JPN, by Deep Impact). This year’s line-up included last year’s Japan Cup (G1, 2,400m) champion Cheval Grand who kicked off the 2018 season with this race, and 2017 Satsuki Sho (Japanese 2000 Guineas, G1, 2,000m) winner Al Ain who came off a runner-up effort in the Kyoto Kinen (G2, 2,200m; Feb.11). 2017 Mile Championship (G1, 1,600m) victor Persian Knight finished fifth in his first outing of the season, the Nakayama Kinen (G2, 1,800m; Feb.25) which was won by Win Bright. 2016 Best Three-Year-Old Colt Satono Diamond came off a third in his first start of his five-year-old campaign, the Kinko Sho (G2, 2,000m; Mar.11), which was claimed by 2017 Tokyo Yushun (Japanese Derby, G1, 2,400m) runner-up Suave Richard and in fourth was last year’s Osaka Hai third-place finisher Yamakatsu Ace. Other notable contenders were Danburite and Mikki Swallow, winner and runner-up of the American Jockey Club Cup (G2, 2,200m; Jan 21), respectively, and Triomphe, victor of the Kokura Daishoten (G3, 1,800m; Feb.18).